I've been eagerly awaiting the reprint of ASL Starter Kit 1 for quite some time. Originally, it was scheduled for late July. 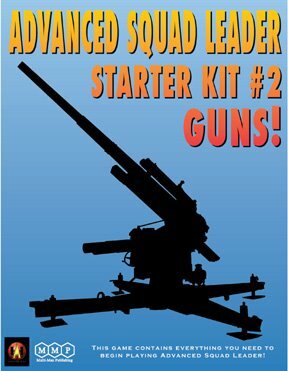 It is going to the printers along with Starter Kit 3, which is in the final stages of playtesting. I decided that I should probably just get all 3. They are not very expensive, and if I really get into playing ASL, I will regret not having them all. That thought made me wonder how long it would be before Starter Kit 2 became unavailable. I did a quick search for it, and couldn't find a single copy. Multiman Publishing still had some, but at $28 + $7 shipping, I thought I could do better, and perhaps add more games to this order. Kevin Moody pointed me to Bunker Hill Games. They had 3 copies left. At $23 + actual shipping cost ($4.70), it was an easy choice. Sadly, they had no other games on my want list. They are located in New Hampshire, only a 2-hour drive from me, so it'll likely be overnight shipping. I placed the order Sunday afternoon, and it was ready to ship 2 hours later. Starter Kit 2 contains all the rules for 1 and 2 (merged together, but highlighted so you can tell them apart), 2 counter sheets, 2 boards, and 8 scenarios. The focus is on light ordnance (mortars, anti-aircraft guns, anti-tank guns, and artillery). I received the delivery on Tuesday. The 1/2" counter sheet was so badly punched that some of the text ran over onto the next counters. I contacted Multiman. I've already received a pristine replacement sheet.